No spamming, trolling, or vandalizing any part of this page. No swearing, or even anything that can be considered "censored for little kids". "Stupid" is allowed. Be yourself; talk to me the way you talk to a friend or someone you know. One more thing: requests for wi-fi gaming go in the section below. You can request for either Mario Kart Wii racing or Super Smash Bros. Brawl matches. Try to ask when I am online. I am usually available to play on Saturday and Sunday afternoons and Friday evenings. Vinnie Do you want to be friends? My userbox code is on my userpage. 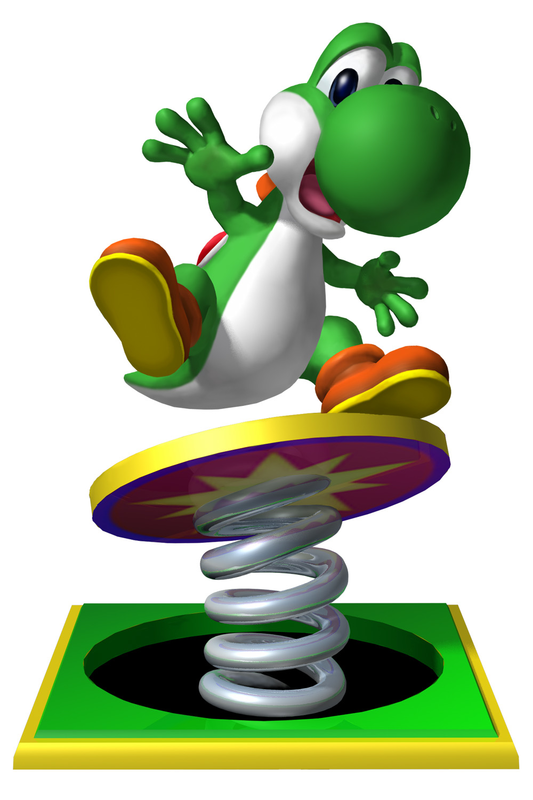 45px This user is friends with DK and Diddy Kong vs Bowser and Bowser Jr.
45px This user is friends with Yoshidude99! That's true; if you want, you could try inserting that information at the end of the introductory paragraph for the article, I think it would be a tad more relevant there, imho. Vinnie Nope, not yet. I'm going to. I think everybody is ready. Yeah. btw I started the room. Maybe tomorrow, because I can almost gurantee that there will be more people playing. Well, I'd say definitely not one for the screw-like platforms, as those are just part of the planet, so they're not notable enough to have their own article, and I think I'd have to say no to the jets of sand as well, though you could mention something about them in the appropriate place on the article for NSMBW if it's not already there. As for the green and blue platforms from the Space Junk Galaxy, I'm fairly certain that those would be important enough to warrant its own article, as they also appear in other places as well, like the second mission of the Cloudy Court Galaxy, for instance. Just make sure to mention that there are other colors as well, like the red pie shaped ones that form a circle, the brown cubes, etc. Also, make sure you give the article an appropriate name, maybe like "Space Junk Platforms" or something along those lines, because it's going to be conjectural. As such, don't forget to add the conjectural template to the top of the article as well. Sorry, I've been extremely busy all day, okay um...how about: "A wiki is an excellent way to productively utilize the Internet for overall constructive purposes, and effectively accomplishes a wide variety of beneficial outcomes, including the establishment of multiple edifying bodies of information readily available to anyone with access to a computer, the organization of many separate ideas and beliefs collectively consolidated to produce an instructional database synonymous with that of an encyclopedia, and continual involvement with a generally positive and contributing subculture cooperatively working on a daily basis to achieve its desired ends." If you need something else, let me know. Well, in a way, that was my opinion...alright, how about this: "I think a wiki is a wonderful thing because it allows people of all ages from virtually anywhere in the world to collectively come together to create the best possible informational database on its given subject." Is that any better, or not? Me too! Just a question: can you play MKW right now? I know you take requests and I'm kinda in the mood to race. Mariomario64! Do you want to be friends? Who has lost his tail? Not bad, never heard of that before, but let's just say that it would have to be extremely-triple-insanely-awesome for me to consider it better than SMG2. Idk, I've never actually heard of it. What's it about? This page was last edited on June 12, 2012, at 00:39.